The word "Amen" is often said at the end of religious prayers. 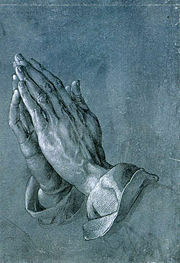 Painting by Albrecht Dürer. The word Amen (Hebrew: אמן, meaning "Firm" or "Verily," Arabic آمين ’Āmīn) is a declaration of positive affirmation found in the Hebrew Bible, the New Testament, and in the Holy Qur'an. English translations of the word include, "So be it," "Truly," and "Let it be." Colloquially, it can also mean "I agree," or "Well said." The word is widely used in Christianity, Judaism and Islam. Muslims say "Amen" (or, more correctly, Āmīn) as the standard ending to the Dua (Supplication). For Jews and Christians of different denominations, the term "Amen" is often adopted in worship and hymns as a conclusion to prayers, or as a jubilant response to a sermon. For billions of people around the world, the word "Amen" affirms their connection with God. It therefore brings comfort, peace and solace. Just as there are different types and forms of prayer (for example; petitionary prayer and prayer of thanksgiving), the word "Amen" can be expressed internally or externally, in public or in private. In English, the word "Amen" has two common pronunciations: Ahh-men or Ay-men. The Ahh-men pronunciation is the one that is used in performances of classical music, in churches with more formalized rituals and liturgy and liberal Evangelical Protestant denominations. The ay-men pronunciation, a product of the Great Vowel Shift dating to the fifteenth century, is associated with Irish Protestantism and conservative Evangelical Protestant denominations generally, and the pronunciation that is typically sung in gospel music. Increasingly, anglophone Roman Catholics are adopting the "ay-men" pronunciation. Jews usually pronounce the word as it is pronounced in Hebrew: "ah-MAIN." Amen is derived from the Hebrew word emuna or "faith" with the same linguistic root, implying that one is affirming with, and of, "the faith" of Judaism (and its belief in Monotheism). Some Judaism have seen in the word Amen acronym for אל (’El) מלך (melek) נאמן (ne’eman), meaning "God, King [who is] Trustworthy." In traditional and modern Jewish liturgy, "Amen" is often used by a congregation as a way to affirm and subscribe to the words uttered previously by whomever leads the prayer. "The liturgical use of the word in apostolic times is attested by the passage from 1 Corinthians.... Justin Martyr (c. 150) describes the congregation as responding "amen," to the benediction after the celebration of the Eucharist. Its introduction into the baptismal formula (in the Greek Orthodox Church it is pronounced after the name of each person of the Trinity) is probably later. Among certain Gnostic sects Amen became the name of an angel and in post-biblical Jewish works exaggerated statements are multiplied as to the right method and the bliss of pronouncing it." The catechism of curses of the Law found in Deuteronomy 27:15. A double amen ("amen and amen") occurs in Psalm 89. Amen occurs in several doxology formulas in Romans 1:25, 9:5, 11:36, 15:33, and several times in Chapter 16. It concludes all of Paul's general epistles. Amen concludes the New Testament at Rev. 22:21. Muslims use the word "Āmeen" not only after reciting the first surah (Al Fatiha) of the Qur'an, but also when concluding a prayer or 'Dua'. ↑ Classic Encyclopedia: Amen Retrieved July 23, 2007. This page was last modified on 10 March 2016, at 18:55.